Zoysia grass is a popular landscaping grass and it is Zoysia tenuifolia which is a tropical spreading grass that is suited to sloping sites and lawns that is most popular. Loved by landscapers and gardeners alike for its drought-tolerant nature and the growth habit which requires little or no mowing. Although it is suited for use as a lawn, it is not suited for use in high traffic areas, and this is because of its growth habit. 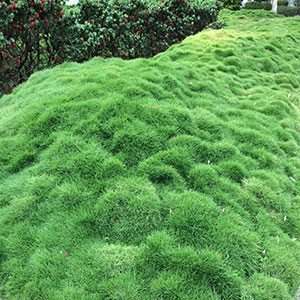 Over time Zoysia tenuifolia begins to mound, it develops bumps and lumps, it does great a dense lawn, however it is also very sculptural. When used on a sloping site it can be a landscaping feature all by itself. With fine light green foliage Zoysia tenuifolia is a tough grass substitute. It sometimes refereed to as ‘no mow’ grass, it is tough, hard wearing and reasonably drought tolerant. Used most commonly as a no traffic lawn substitute. Can be used grow between pavers or flagstones. Spread – To around 35 – 45 cm. Position – Full sun to light/part shade. Frost tolerant – Will tolerate light frosts once established. Fertiliser – A slow release fertiliser in spring is advisable. Water before and after fertilising. Best grown in warm humid climates Zoysia can be started from seed, plugs or ready to lay sod. To keep it like a lawn, you will still need to mow it occasionally, however if you mow it often it will not look that good. It really needs to be left to develop its natural bumpy appearance. Zoysia tenuifolia is available both as plugs, potted and as ready to lay instant turf depending on supplier. Seedlings or plugs can be planted at around 25 – 30 cm apart. They are best planted in warmer months as they will spread more quickly and therefore prevent weeds from colonising bare patches between the seedlings. Over time they will spread to form a dense matt. Other Varieties include Varieties Zoysia japonica and macrantha both used widely as a replacement for conventional grasses. The varieties ‘Empire’ (Zoysia japonica) and ‘Nara’ (Zoysia macrantha) are a little better in cooler climates than others.